66254 Luke Skywalker Maquette is a 6" maquette model of the Luke Skywalker as a Rebel pilot. It is purely a model, and should not be used as a toy. It was one of four of the Maquette line released in 2007. Though most minifigures don't have this feature, Luke is able to hold the lightsaber with both hands. However, he is larger than the average minifigure, at about two times the size. 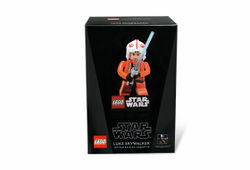 This maquette can also be found in the set 66221 X-Wing Fighter and Luke Pilot Maquette Co-Pack. Facts about "66254 Luke Skywalker Pilot Maquette"
This page was last edited on 9 January 2016, at 19:50.